The game was largely a one-sided affair, with the full time side running out with a 5-0 victory. All their goals came in the first half, including a seven minute spell that saw them net three times. The goal of the night was the fifth; a stunning 25 yard thunderbolt from Bees’ left back Leon Redwood. It was reminiscent of JJ O’Donnell’s wonder strike against Staines Town on Boxing Day last season. The other goals came from Harry Forrester, Stuart Dallas, Rowendy Schoop and Myles Weston. For me, though, this was never about the result. I know that’s easy to say, and if Hampton had won, I would be declaring our title winning potential right now! No, this night was all about getting back to The Beveree Stadium, and watching the team play. I was intrigued, and a little excited, to catch a glimpse of the new faces wearing the Hampton red (as it goes, both teams wore their away kits. No, I don’t know why either)! In total, there were five new players in the starting lineup, with the exotically named Vittorino Giarletta among them. The Italian striker has played in the Italian Serie C & D and is now looking to continue his playing career in England. In truth, manager Mark Harper probably won’t have learned an awful lot from last night, and to be fair I’m not really sure he would have expected to. Dean Inman made some typical good blocks and challenges, while Neil Jenkins’ distribution from left back was good. Craig Ross made some decent saves despite letting in five, and Charlie Moone ran his socks off up front. The striker saw his eighth minute penalty saved, and had a fine goal disallowed for offside, perhaps rather harshly. There were signs of an understanding with Giarletta, but in truth it was all Brentford for the first 45 minutes, and it could have been many more than five. Harped was also without some key players due to holiday and work commitments, namely James Simmonds, Billy Jeffreys and Josh Huggins, while striker Joel Ledgister is continuing his recovery from a serious knee injury. 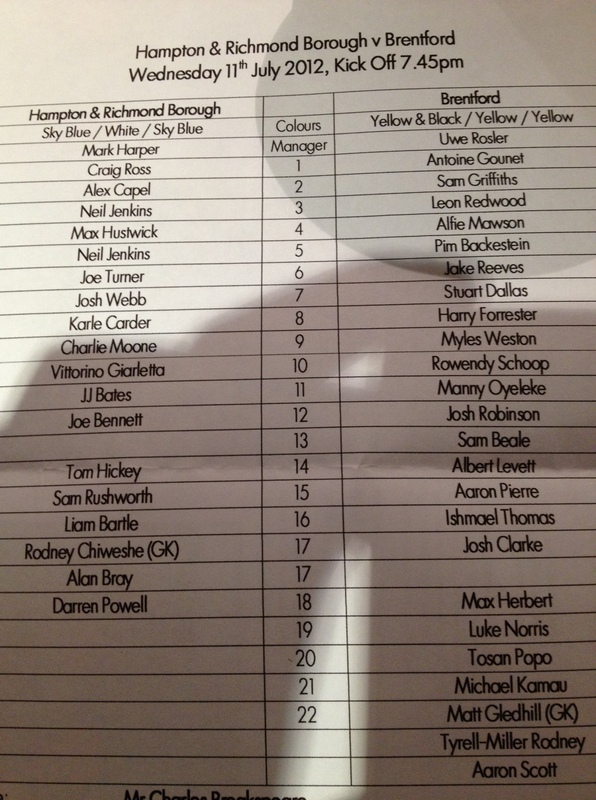 The team sheet, complete with two number 17s! The second half, by contrast, was a bit of a damp squib, at least what I saw of it was. I was in the bar for the first fifteen or twenty minutes of the second half! Towards the end, Borough enjoyed a little spell of dominance, but the scoreline didn’t change. The most unusual thing in the second half was that two Hampton players were wearing number seventeen on their backs! All in all, then, it was great to be back at The Beveree watching football. OK, so we didn’t have a goal to celebrate, but I saw some familiar faces, and had a couple of lovely pints, not to mention a cracking cheeseburger. From the club’s point of view, the bumper crowd of 929 will have generated some much needed income. The clubhouse was packed, and the queue for the snack bar didn’t diminish from the time I arrived forty minutes before kick off until after the final whistle, when I finally got my burger! It just goes to show how vital these games are to non-league clubs. The revenue they generate can be the biggest single match income a club gets during the season, barring a cup run. On the pitch, it gives the players a chance to test themselves against more exerienced, professional opposition. In the end, this match wasn’t an ideal first fixture considering the players have been back in training for only a few days. The Brentford players looked at times like they hadn’t even stopped playing since last season. But if you want to stage the prestige friendly, you have to do it when the bigger club say so. I enjoyed myself, though, and am looking forward to seeing more preseason games before the real business begins. 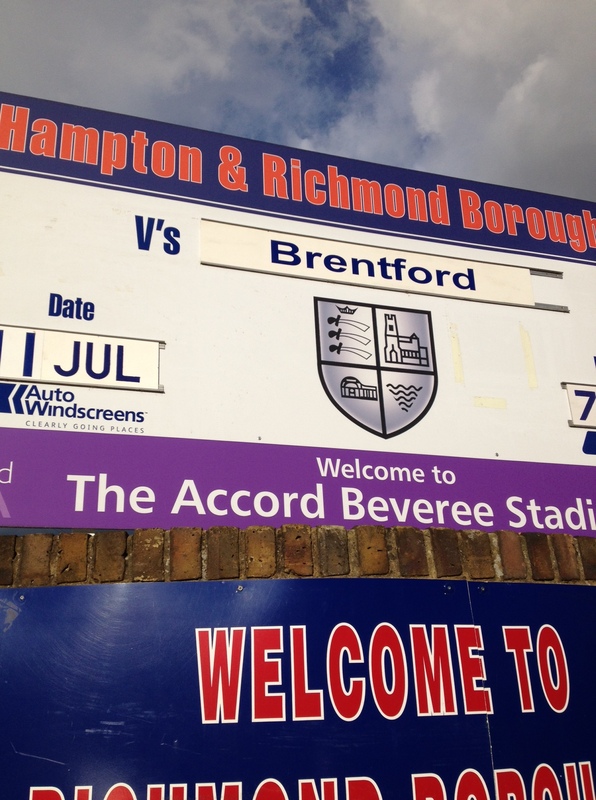 Posted on July 12, 2012, in UTL Archive and tagged Brentford, Charlie Moone, Craig Ross, Hampton & Richmond Borough, Mark Harper. Bookmark the permalink. Leave a comment.